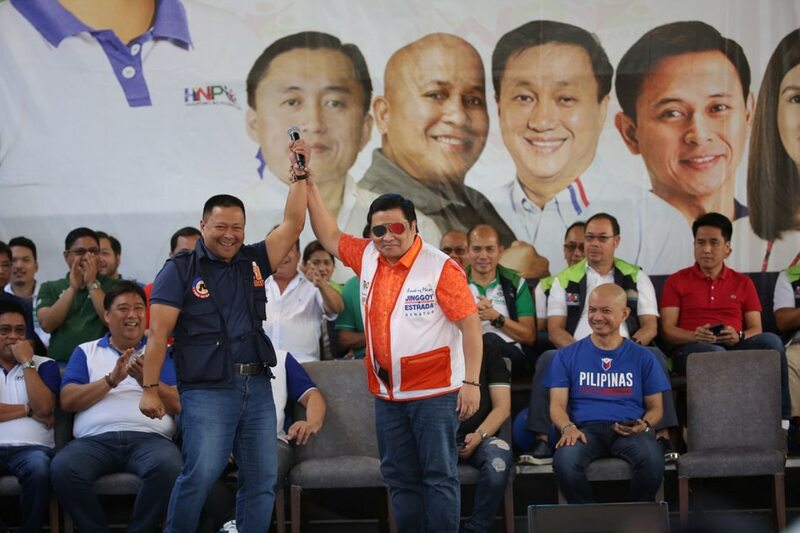 PAMPANGA - (UPDATE) Re-electionist Senator JV Ejercito and his half-brother, former senator Jinggoy Estrada, set aside their feud on Tuesday as they shared the same stage during the launch of the campaign of the administration coalition, Hugpong ng Pagbabago. Ejercito previously said he hopes to avoid a possible clash with Jinggoy in the May 13 elections. Estrada, however, said their father has no problem with having both sons running for a Senate seat. “I have always mentioned to the media, to our friends, kung ako lang masusunod, pwede naman kaming dalawa,” he added. Ejercito, meanwhile, described their encounter as "historic." “Maganda naman (It was nice). Let’s see how it goes. Historic. Dito pa nangyari sa Pampanga,” he said. Estrada’s decision to seek a Senate comeback prompted Ejercito to leave Pwersa ng Masang Pilipino, the political party of their father, Manila Mayor Joseph Estrada. This decision strained Ejercito's relationship with their father among other things, said Estrada.